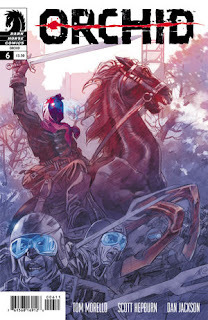 The Fellowship was fortunate enough to obtain a copy of ORCHID #6 from Dark Horse Comics. Tom Morello writes, Scott Hepburn draws, Dan Jackson colors, and Nate Piekos letters. This book is about a diverse group of individuals who are rebelling against a tyrant in a modern dark fantasy world. Orchid has brought them together, and they find themselves assaulting the tyrant’s stronghold in order to save one of their number from execution. There are an awful lot of soldiers there, of course, but the team has a secret weapon. Dark Horse describes this title as ‘action/adventure’ and as such it does not disappoint. There’s something about a lone warrior with a sword on a warhorse charging into a throng of modern riot police. Wow. (But maybe that’s just me…) Tomo Wolfe is a fun tyrant, too, and we get some backstory on him here. The art is gritty and grown-up as well, fitting nicely with the story. ORCHID #6 is available now at your FLCS or by order from darkhorse.com.